Posted on August 30, 2016 at 12:26 pm. 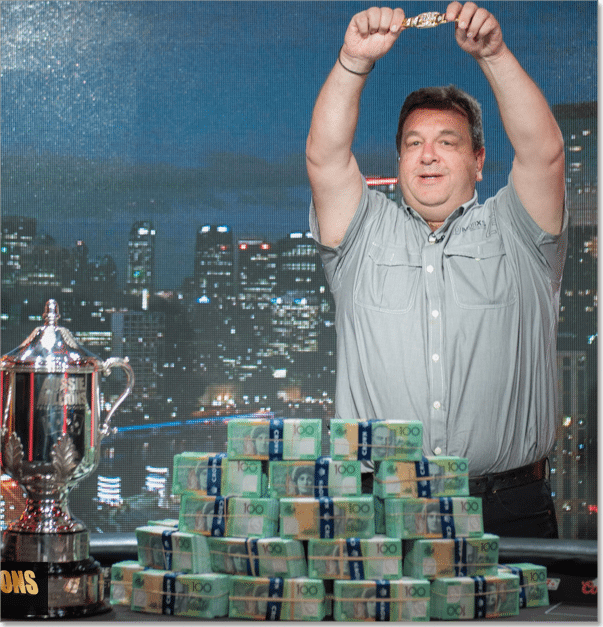 Manny Stavropoulos, from Melbourne, is pictured here after winning the 2015 Aussie Millions Main Event. Australia’s biggest and richest poker tournament, the Aussie Millions, will no longer be part of the PokerStars-backed Asia-Pacific Poker Tour. Tournament officials announced the tournament would return to stand-alone status, just days after PokerStars revealed it was scrapping its regional tours, with events now falling into PokerStars Championships or PokerStars Festival categories. The Aussie Millions, which has been running since 1998, joined the APPT in 2014 and gained considerable international exposure through the deal. “On behalf of Crown Management and the Poker Team, we would like to extend our sincerest thanks to everyone from APPT including the management and operations teams, along with the poker community for their ongoing support,” Crown Melbourne Tournament Director Joel Williams said. In a brief press release, Crown Casino Melbourne also confirmed the 2016 Asia Pacific Poker Tour, Melbourne, beginning on October 6, will be the last tournament of the tour to be held in Victoria. “Crown Melbourne can confirm that the 2016 Asia-Pacific Poker Tour (APPT) Melbourne, set to take place on Thursday 6 October 2016, will be the final APPT event to be held in Melbourne,” tournament director Joel Williams said. “Crown Melbourne can also confirm that the 2017 Aussie Millions Poker Championship, set to take place from Wednesday 11 January to Monday 30 January 2017 will revert to a stand-alone event. The move is not expected to change the prize money or the pathways into the tournament, with all scheduled satellites expected to still be run. “All previous Satellites entry pathways are expected to remain active for the 2017 Aussie Millions,” William said. PokerStars had flagged the possibility of a worldwide poker tour since the European Poker Tour moved outside of European borders. The PokerStars Festival and Championship categories will both feature leading players awards, including the winner being given a VIP package, which includes accommodation, the buy-in to the first main event of the following year and a ticket to an invitational tournament, which the winner will take home a USD $100,000 first prize. The first PokerStars Festival event is in New Jersey, October 29-November 6. Held at Resorts Casino Hotel in Atlantic City, 40 poker tournaments with buy-ins ranging from $100 to $5,000 will take place. Big names who are confirmed include Chris Moneymaker and Daniel Negreanu. “We are committed to growing the poker market in New Jersey and part of this strategy is to help make New Jersey the poker hub of America in November,” Eric Hollreiser, PokerStars’ Director of Corporate Communications, said. Players visiting us from United States can play at a number of online casinos such as Raging Bull Casino and enjoy multiple variants of Caribbean Stud Poker, Texas Hold’Em and Three Card Poker.